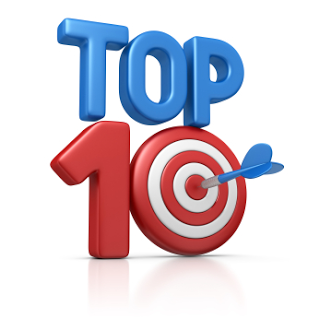 Top 10 things to on a Carnival Cruise Line to Cuba! Get your binoculars ready! 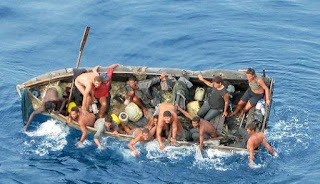 Since Cubans are leaving the "UTOPIA" of Cuba on hand made rafts, risking their lives, try to spot Cuban Rafters in the open ocean, in the comforts of your Cabin, or the luxurious balcony! If the first game is a little to strenuous for you, try this fun filled adventure, roam along the ship and try to spot the un-wanted Cuban-Americans, have fun blowing their cover and turning them in to have them removed from the ship!
" La Revolucion es una mierda!" translation: "Normalization is so cool!" While drinking your mojito, raise your glass and toast " Que mierda es el comunismo!" Translation: " We have to see Cuba before it changes!" While visiting the monument of che, stop for a second, start to reflect and ponder how many Cubans he executed! No it's not a conga line, better..., get out and exercise while marching with the Ladies in White on the way to Church. Don't mind the police beating up the ladies simply doing a quite protest. Since the dictator Fidel knows everything and he knows his precise moment of death, go by on a tour bus by punto cero(the dictator's compound) and get off the bus and yell towards the compound the precise date that you think the dictator will expire! For kicks yell out the time also!! Grand prize for the winner: a bottle of Jalapa! Carnival cruise Lines can hook you up on Q&A tour with dictator Raul. My suggestion is to ask Raul about political prisoners in Cuba....That should get the Q&A session off to a bang! Since Cubans are not allowed in varadero or own anything in Cuba for that regards, take a whole Cuban family to the stolen properties and illegal hotels on Varadero beach!!!! Cruising around Havana in an open top 50's relic(rebuilt with 1000 different kinds of spare parts) would have to be the highlight of any trip to Cuba. Snap chat, twitter, and facebook away while taking in the sights of all the stolen properties that are dilapidated by years of neglect and abuse! "Nearly 900 pounds of cocaine was found Thursday on a Cuban ship in Panama that was headed for Belgium. A U.S. Representative from Florida says the Castro regime has been caught drug trafficking red-handed." 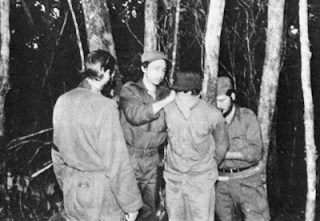 Could it be that the Cuban dictatorship has done this over and over? What about those pesky missles found on a ship in Panama? Even Inspector Clouseau can figure this out!!! "Ramon Saul Sanchez denied US residency, asked to leave country"
Let me get this straight......... Mr. Sanchez has lived here in the US for 49 years and after waiting for 14 years for his residency..ALL OF THE SUDDEN, just before they are set to sail on the Democracy flotilla, he is notified to "GET OUT THE COUNTRY?" Sounds fishy......Could it be a request from the Cuban communist dictatorship? Is it because he is an activist against the Cuban dictatorship? The dictator even after attending a baseball game with Obama last month called the US an "ENEMY"
but Alfredo playing nice,nice, with the Cuban dictatorship and giving them everything they want, will soften them and it will lead to real changes in Cuba!!! 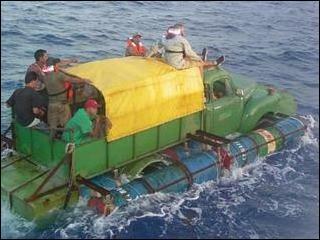 Cubans can go on Carnival Cruise lines now......I guess? No Cubans Allowed.....Where is all the outrage from ALL the political activist? NO CUBANS allowed on Carnival Cruise Lines on trips to Cuba! Can you imagine if this happened to any other ethnic group or race ? 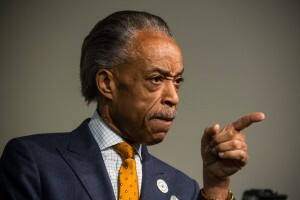 Where is the outrage and ryhmes from Jesse Jackson and Al Sharpton??? "HELL NO WE WON'T GO!" 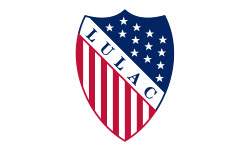 Where's LULAC and all the "LATINO" activist?? Hey carnival cruise lines tourists......I thought normalization would change things? This is what the dictatorship does to peaceful protestors simply asking for FREEDOM! Even though I will NEVER step foot in Cuba until the dictatorship is gone and Cuba is FREE(before I get hate email, that is my personal opinion and I have no family in Cuba), Carnival Cruise Lines will NOT allow AMERICANS born in Cuba to travel to Cuba on its cruise lines. YES....normalization with the dictatorship sure helps Cubans on both sides! 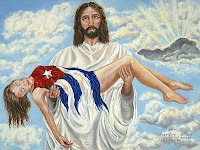 Cuba: NEVER....NEVER.......I will never give up on you! All this talk about cruises(No Cubans allowed), normalization, a Cuban consulate in Miami, Cuban baseball players playing in MLB, and the recent Obama tour in Cuba is enough to make you crazy! NEWS FLASH...... NOTHING HAS CHANGED IN CUBA FOR THE CUBANS!!! THEIR IS STILL NO FREEDOM!!!!!!!!!!!!!!!!!!!!!!!!!!!!!! The struggle for FREEDOM continues even though it seems like EVIL keeps winning here in Cuba's case. 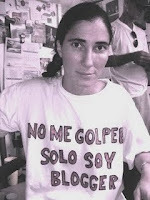 Anyway, I will never give up in regards to Cuba's FREEDOM!!! Remember all those Reggae songs denouncing Aparthied South Africa, well I'm a big fan of Reggae, and since NOBODY has done a reggae song for Cuba's FREEDOM, I will leave you with the song above, and when listening to the song just change the lyrics from Hawaii to Cuba!! !